It was a full-house Friday night at Chaifetz Arena in downtown Saint Louis. Grammy winner, Sam Smith, has not performed in Saint Louis for nearly two years, which is why it is no surprise his concert sold out. I typically don’t listen to Sam Smith; I had only known his most popular songs such as “I’m Not the Only One,” “Stay,” and “Too Good at Goodbyes,” all of which were performed. Smith’s music, as he acknowledged, is pretty depressing, so of course I was concerned the concert would be a bit of a bore. However, it was the opposite. Sam Smith is especially charismatic, which distracted audience members from the depressive musical tones. He waves at the crowd and takes the time to have real conversations with the audience. If you’ve read my previous articles, you know how essential I believe stage presence is to an entertaining show. Smith’s conversations about love, gay rights, and learning to appreciate the love surrounding you outside of romantic relationships touched my heart, along with the rest of the audience. I expected to walk out of Smith’s concert in a discouraged, “thinking about my ex” type of mood, but instead, I walked out of there hopeful and humbled. I found it humorous how Smith acknowledged how upsetting his music actually is. I respect artists who can poke fun at their own creations because it signifies their humbleness. Aside from the blue tones of Smith’s music, his lyrics are actually quite touching. I appreciate music that possesses relevant meaning to more than a single group of individuals; his songs can relate to just about anybody who struggles with love and the expectations of society. He’s definitely a thought-provoking artist, and that’s one of the many reasons as to why Smith’s music has been so successful. Though Smith has an incredibly rich voice, his show would not have been nearly as enjoyable had it not been for his band and back-up singers. The band was fantastic, and his singers added to the dramatic effects of his show. And trust me, there were many dramatic scenes when Smith performed. In his song dedicated to the LBTQ community, “HIM,” Smith’s back-up vocalists assisted him in making it a touching, eye-opening piece in the setlist. Smith loves to add drama to his music, and the performance of this song proved to be as dramatic as the music itself. The best part of “HIM” was the rainbow lights flashing the stage right as Smith hit his last note. Smith isn’t ashamed of who he is, and everyone in the arena could appreciate that. Saint Louis loves Sam Smith, and I can see why. I wasn’t a huge fan before, but I certainly will take the time to appreciate Smith as an artist and performer going further. His musical sound isn’t for everyone, but his lyrics have the potential to be. Two years was far too long for fans to be without Sam Smith, and hopefully they won’t have to wait two more years again. 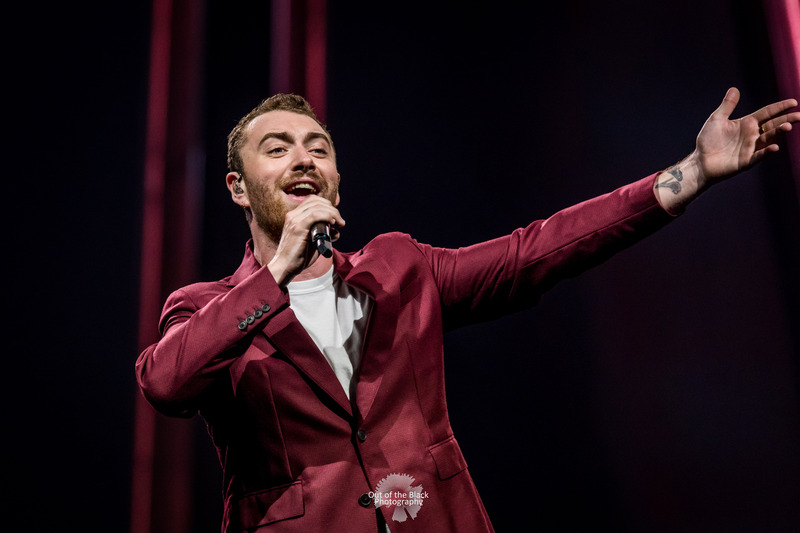 Sam Smith’s “Thrill of It All” tour will finish up in the U.S. September 8th in Seattle, Washington, and will continue for three more shows in Canada. His tour officially ends September 13th in Calgary.